Hatters striker Jack Marriott enjoyed a full debut to remember – bagging a double as Luton claimed a notable Capital One Cup scalp by beating Championship side Bristol City this evening. The forward scored once in each half, producing two clinical finishes and giving his manager John Still real food for thought over the striking berths for Saturday’s visit of Oxford United. Luton’s boss had made a hefty eight changes to the side that started against Accrington Stanley on Saturday as Dan Potts, Stephen O’Donnell and Mark O’Brien all came in for their debuts, while Mark Tyler was recalled in goal. The visitors picked a strong team and had easily the best of the first half, with Derrick Williams rifling over, Callum Robinson nodding wide and Korey Smith shooting straight at Tyler. Hatters’ keeper was worked harder on the half hour mark, though, sticking out a left glove to turn Robinson’s effort over after his defence, who stuck to their task tremendously, momentarily switched off. Luton, who had taken their time to adapt to the 3-5-2 formation selected, finally produced an effort of note, with Potts finding Marriott, who scuffed at Hamer. After long spells on the back foot, the hosts then finally gained a foothold and were ahead moments before half-time, Marriott twisting and turning before beating Hamer low down for his first goal in Luton colours. The second period saw City come out strongly, with Jonathan Kodjia finally showing some of the reasons as to why Robins shelled out over £2m for his services, forcing Tyler into a wonderful low save from his daisycutter. However, back came Town as O’Donnell’s searching free-kick cannoned off the post, while Kodija should have done much, much better than skew wide from the edge of the box. 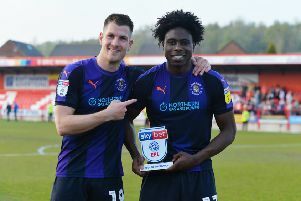 With Pelly Ruddock Mpanzu starting to show signs of his old self and becoming a driving force through the centre, Luton moved 2-0 in front. The fit-again midfielder looked up and sent a glorious through ball through to Paul Benson who tucked his shot past Hamer. Kodija again missed a presentable chance, as Marriott put the game beyond doubt, pouncing on an error to drill past Hamer. A shell-shocked City did manage to find a way back into the game as Luton dropped their concentration and Robinson was left in acres of space to find the net. However, any hopes of forcing extra-time were gone as Tyler saved Bobby Reid’s header, while Kieran Agard was off target when left unmarked, meaning it was Hatters who reached the second round for the first time since 2007. Next up though is the visit of a buoyant Oxford, who themselves picked up a cup upset, hammering Brentford 4-0. Hatters: Mark Tyler, Scott Cuthbert, Steve McNulty, Luke Wilkinson, Stephen O’Donnell (Scott Griffiths 77), Dan Potts, Mark O’Brien (Nathan Doyle 75), Cameron McGeehan, Pelly Ruddock Mpanzu, Jack Marriott (Josh McQuoid 79), Paul Benson. Subs not used: Alex Lawless, Ryan Hall, Elliot Justham, Luke Guttridge. Robins: Ben Hamer, Derrick Williams, Aden Flint, Luke Ayling, Korey Smith, Callum Robinson, Ryan Fredericks (Wes Burns 58), Luke Freeman, Aaron Wilbraham (C), Marlon Pack (Bobby Reid 74), Jonathan Kodjia (Kieran Agard 67). Subs not used: Mark Little, Adam El-Abd, Max O’Leary Scott Wagstaff. Hatters MOM: Jack Marriott. Lovely finishing as he has given Still a real selection headache.